It’s not a glorified Toyota. That was my main discovery testing out a 2017 Lexus RC 200t F Sport, a two-door car that has a 241-horsepower engine, an 8-speed transmission, gets 32 miles to the gallon, and looks like the twin brother of the coolest Mazda you’ve ever seen—with a better front fender. The 200t is not meant to push you forward at insane speeds, but don’t tell that to the guy I passed in a Buick Regal a few miles from where I live. At 45MPH, you get an adequate if not overblown punch, enough to help commuters merge more effectively but not necessarily win any races. What I liked best about the car is how much it sticks to the road around tight corners, similar to a few others I’ve tested of such as a Ferrari California T, a Honda Pilot, and a few trucks. In most cases (e.g., the trucks) you have to slow down and brace yourself a bit. The 200t barely squirmed. Matching up nicely with these findings is the fact that the stereo does push you back in your seat. The massive speakers on the doors are bigger than anything I’ve seen in a coupe like this. There are 17 speakers in all with a total output of 835 watts. Just in time for this test, I downloaded the new Bon Iver album and could hear every Auto-Tune effect, every weird chirp and synth part, and was absolutely mesmerized by the farm-fields, the sun setting, and the black asphalt. Lexus does an excellent job of cocooning you in the cockpit. The red F Sport had a tan interior, snug in a good way like the older Infiniti models that used to emphasize leather wrapping like you’re in a Learjet that drives on the road. This RC is not a Toyota, even if my nephew kept insisting it was and argued about the powertrain and the engine being on loan from a Camry. Not really. The instrumentation in the RC line, which is on loan from the LFA, swings over to the right when you press a button as though you are preparing to start a speed test. I also love the styling. 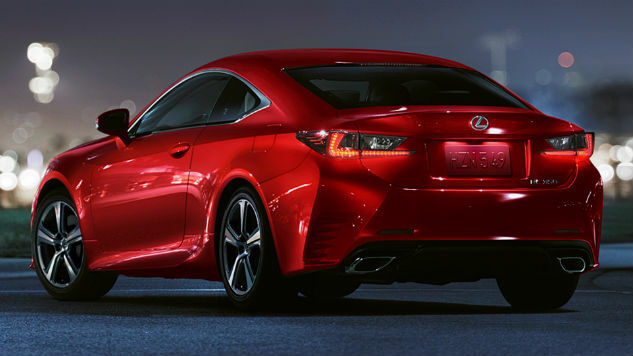 The lines, extending back to the trunk, make a bold statement about being a Lexus and not any other vehicle—say, the rounded bulge of a BMW in the back or the starkness of an Audi. You know this is a Lexus when you look at the grill, which is quite pronounced. Few cars make me want to keep driving longer than usual. I won’t brag about the power too much, since the 200t is not meant for quick starts. There’s some whine going on here, but I do like the power you can achieve at higher speeds in the upper gears (paddle shifters optional). It’s one of my favorite tests in recent memory, it’s not an outrageous price—and it’s most definitely not a Toyota.